Tasting Notes |Lagrein To find out where to purchase our wines (cellar door, restaurants, retail outlets and overseas distributors) please see our Where to Buy page. This Chardonnay is more linier and tightly wound than some other years. Great aging potential here! THEWINEFRONT.com.au Gary Walsh comments ... "Complete wine" an easy 95/100 for me. THE WINE FRONT.com.au. 26th Oct. 2017 by Mike Bennie"Creamy textured sparkling of watermelon juice-meets-strawberry juice scents and flavours. Attractive, simple wine of fruit purity, light spice, great freshness, fine bubble dissipating as the wine stays open. I like the chalkiness and pucker to the finish, that seals the deal. Good feel all up. Nicely Done. " Matured and fermented in Qvevri and old white French oak. Taut, mineral, savoury and dry but with lots of texture from the qvevri ...is looking every bit as classy as the 2016 and will age well into the future. THE WINE FRONT.com 16 Jun.2018 Review by Mike Bennie. Produced from Syrah from Cobaw Ridge’s biodynamic estate, it’s raised in both old oak and qvevri (amphora). It’s a serious rendition of the allegedly frivolous wine style of rose. Indeed, this is one that drinks a charm ice cold, but just as well approaching ‘room temperature’. Pale garnet colour, a touch haze, but very bright and inviting. Scents of brambles, raspberry, sour cherry, rose hip tea. Leans down the rose hip tea and sour cherry flavour spectrum too, holding fine shape with silky tannins and perky, mouth-watering acidity. It has such a vitality to it, tinged with savouriness and decidedly in that lean, light and pure feeling zone, with some beautiful sour-sweetness too. Superb rose. The return of il pinko syrah rose`. Matured and fermented in Qvevri and old white French oak. Taut, mineral, savoury and dry but with lots of texture from the qvevri amazing intense colour.. quite a wine! The Pinot Noir showing quite intense plush flavours but at the same time very focused... and all at 12% Alc. Amazing ! THE WINE FRONT : Gary Walsh - 19th December 2017. Rated : 94 Points : 2015 Cobaw Ridge Pinot Noir thewinefront.com.au for full review. Rootstock Festival 2017... "their wines were pretty much the standout of the event for me. I think their wines satisfy my bent for ‘classicism’, but without being mucked about ......". Cherry and plenty of spice, a wild mint and herb perfume, and something like almond in behind. It's light-bodied, but doesn't lack flavour, flirts with the green end of the spectrum, but dosen't lack ripeness. it's brisk and animated, with again that tast of almond, alongside fine emery tannin, and a slightly soupy red fruited finish of fine length. Personality and heaps of Charm. Lovely stuff . The other expression of our Syrah, a wine with altitude and attitude. Juicy supple with poise and drive. THE WINE FRONT : Mike Bennie - August 2017 Rated : 94 Points. This is a charming, savoury shiraz (syrah!) of beautiful perfume, spice, earthiness, cusp-of-ripeness red fruits and a hustle of brisk, cool acidity. The takeaway message is 'medium weight red of spiciness and a relaxed feel in the pallet with a fine trill of tannins to close'. You could close your eyes and be drinking best of northern Rhone, or simply give in to the wines unfettered, herb and spice, red fruit charm. It's almost on the cusp of rugged pinosity too, in its way. Big love. Cellaring should reward likewise. Very much typical of our Syrah from a cooler year, aromatic on the nose, savoury spice and a fine dusting of black pepper to finish. Interestingly it's 12.7 Alc. The classic iron fist in a velvet glove. Huge latent power and structure to burn. This wine will reward you even more with age! THE WINE FRONT :Gary Walsh 25th January 2018. Rated : 95 Points : 2014 Cobaw Ridge Syrah. Cracked pepper, grilled meat, blackcurrant, lavender and dried herb, even some kind of sweet wet earthy stuff. Medium bodied but dense, all the juicy small dark berries, a lick of juniper, layers of spice, a fine sweep of emery tannin, and an intense finish, with rich fine tannin trailing in its wake. It's a damn fine syrah. An obscure varietal originally hailing from the very north east of Italy. Varietally expressive with abundant savoury and mineral traits, together with dark cherries, spice and liquorice. Fine lifted floral nose and super supple with great length. Just opened Cobaw Ridge's 2013 Lagrein. Wow! This piercing, savoury red is quite brilliant. The Australian Wine Annual 2016: Jeremy Oliver : 2013 Cobaw Ridge Lagrein 95/100 : In the Jeremy Oliver's Top 100 also in The Top three Wines from New or Alternative Varieties. Harding MW - Decanter August 2013 2010 Cobaw Ridge Lagrein was 1 of 6 Wines to be Selected for the launch of "WINE GRAPES" : Authors, Jancis Robinson, Julia Harding and Jose Vouillamoz: at London " RAW" real artisan wine far 2013 vintage. DIAM cork: Our wine is bottled under DIAM cork to retain it's purity and integrity. The Diam corks are going in to often the more expensive and exclusive bottles of wine." -- Oeneo Closures, producers of DIAM, website at: www.oeneo.co.uk . ... Lagrein wines belong to the most awarded reds in Italy and can compete with premium products from other nations as well. Lagrein is almost unknown in Australia, the variety originates from Sud Tyrol - Alto Adige in the far-north east of Italy. Cobaw Ridge in the Macedon Ranges produced the first commercial quantities in Australia. James Halliday in his 2005 Australian Wine Companion scores the 2002 Cobaw Ridge Lagrein at 91 points. Cobaw Ridge held a tasting of their wine and 15 Lagreins from Italy's best producers, also noted to be the largest tasting of its kind outside of Europe in the Southern hemisphere. 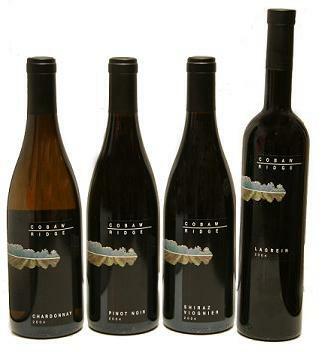 "Several things emerged: first, the aroma and flavour of the Cobaw Ridge wines is utterly typical of the variety. Second, the grape has emphatic character, which binds the wines of both countries into a coherent, tightly knit group... it is also abundantly clear the wines have a long cellaring potential. The '99 Cobaw Ridge is still a bright purple-red, and looks every bit as youthful as the 2002. How long the vivid fruit aromas and flavours - raspberry, cherry, plum, will take to subside is anyone's guess. Having initially had a few doubts about the legitimacy of the variety - was it just a novelty or was it really worthy of attention - I am now a convert to the cause." "I am now a convert to the cause." "2003 Cobaw Ridge Lagrein -- The obscure red lagrein grape originated in Italy's north - east and is planted in a few Australian vineyards – but none yet matches the quality of the lagrein from this Macedon Ranges producer. Seductive, crisp, perfumed with violets and cherries this exceptionally well-balance, fine, medium-bodied red wine is a real beauty." 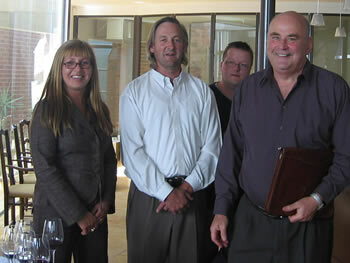 "Cobaw Ridge in the Macedon Ranges has pioneered the grape variety in Australia and has had considerable success with it: 2003 Cobaw Ridge Lagrein "A much more serious offering from considerably older vines... Vigneron Alan Cooper has crafted a much richer wine..., full of blood plum, mint, black cherry, red rose and dusty oak off in the background. Crystal clear palate showing great clarity of saturated fruit and a driving backbone of herbal acidity and very fine tannins on the finish. Great definition and balance. A terrific wine, to be enjoyed with or without food, that will age over the medium term." "2003 Cobaw Ridge Lagrein: Delectable : from the Macedon Ranges." "The cool climate grape variety can be built firm with ageing ability." see News and Events for more recent reviews. back to top of page.